Directions from both north and south are marked with a red-dotted line on the map. 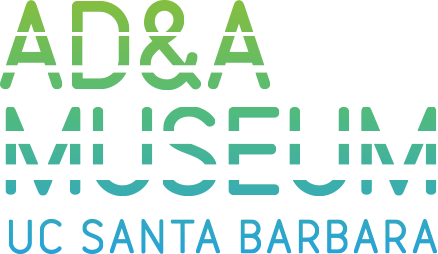 From Santa Barbara, allow 30 minutes for travel to campus, parking, and walking to the museum. From the south: Heading north from Santa Barbara on 101. Exit to Highway 217 (to Airport and UCSB). Stay left; enter campus at East Gate. Turn right at the roundabout on Mesa Ave. At the third traffic light, turn left onto Ocean Road. Continue on Ocean Road through the intersection of Ocean Ave at El Colegio Road. Turn left into Parking Structure #22. See map below. From the north: Heading south toward Santa Barbara on 101, exit in Goleta at Glen Annie/Storke Road. Make a right off the exit ramp and continue south on Storke Road. Make a left onto El Colegio Road. Continue on El Colegio Road until the West Campus Entrance traffic light and bear right. At the next traffic light, turn right onto Ocean Road. Turn left into Parking Structure #22. See map below. To access Lot #3 from the south: Heading north from Santa Barbara on 101. Exit to Highway 217 (to Airport and UCSB). Stay left; enter campus at East Gate. Turn left at the roundabout onto Lagoon Road. At the stop sign, turn right onto UCEN Road. Turn right into Lot #3. See map below. To access Lot #3 from the north: Heading south toward Santa Barbara on 101, exit in Goleta at Glen Annie/Storke Road. Make a right off the exit ramp and continue south on Storke Road. Make a left onto El Colegio Road. Continue on El Colegio Road until the West Campus Entrance traffic light and bear right. At the next traffic light, turn left onto Ocean Road. Remain on Ocean Road as it bears left. At the second traffic light, turn right onto Mesa Road. Continue on Mesa Road through 2 traffic signs and the roundabout, stay to the right which turns into Lagoon Road. At the stop sign, turn right onto UCEN Road. Turn right into Lot #3. See map below. All parking lots are equipped with a Pay Station which will accept credit/debit cards, $1 and $5 bills, but do not give change. For additional information on current parking rates, and the option to purchase a parking permit in advance, please visit Parking Services. The closest parking lot to the Museum is Lot #3, and offers easy access for disabled parking at all times. Lot #3 is also open for general parking (non-disabled) on Saturday and Sunday. Santa Barbara Metropolitan Transit District also provides frequent and reliable bus transportation to and from the UCSB campus. To visit the Santa Barbara MTD web site Santa Barbara-MTD. See map below. From Parking Structure # 22: Exit the Parking Garage facing the Student Services building and turn left. Follow the pathway towards Storke Tower, the tallest structure on campus, and the Arts Building. Just before you reach Storke Tower turn right, crossing over the skateboard lane and bike paths—make sure to look both ways! The AD&A Museum will be ahead on the right-hand side, next to the large metal sculpture by Fletcher Benton. From the Bus Circle: Walk south in the direction of the University Center and Storke Plaza/Tower. When you arrive at Storke Plaza/Tower, The AD&A Museum is on your right-hand side across from the lagoon. The AD&A Museum is wheelchair accessible. For further information please call 805-893-2951.